In this new blog, we start to explore mobile app analytics with our partner Appsee. It’s clear that many of the trends we’ve seen on the web are now playing out in the mobile app space. It’s not a question anymore of whether or not to use app analytics. That was answered long ago, with a big, hearty yes, do it. Today the question has shifted to a different direction, with the answer not being a simple yes or no. Apps need analytics tools, that’s clear. But which ones. Plural. There are so many analytics options that serve so many different tracking purposes, and it’s vital to choose the best ones for your top needs. In fact, 82% of today’s apps use at least one SDK for app analytics, and there’s a new category of app analytics that has swiftly risen to the top: qualitative mobile app analytics. Studies show that this qualitative analytics has become the today’s principal industry tool. But what is it exactly? It’s a collection of visual tools that allow mobile pros to track and understand app user experience. And what’s in this toolbox? User recordings and touch heatmaps, for example. User recordings provide a clear visualization of the user journey, allowing mobile professionals to understand why a certain path was taken and why the user did (or did not) succeed in the journey. In conjunction, touch heatmaps, visually document where and how users are interacting within the app–through every tap, swipe, and pinch–including gestures that were responsive and even more powerful, those that were unresponsive. These two tools in particular allow mobile app brands to obtain actionable, diagnostic insight on user activity. The technology behind qualitative analytics goes beyond aggregate metrics (like DAU and MAU) by recording individual user sessions and revealing the nuances of user intent. Without obvious examples of the results that these tools can deliver, all of the above is just talk. Below are some powerful use cases of qualitative analytics that many mobile app teams are currently utilizing. With user session recordings, you can watch user behavior within abandoned sessions. You can filter sessions that were quickly abandoned and understand what caused users to run and on which screens these sessions were occurring more frequently. Touch Heatmaps help you understand if there are any UI design flaws within the app that are affecting usability. They can reveal issues such as: a user tapping on an element that isn’t really tappable, or user swiping to get out of a certain screen when the swipe gesture isn’t actually possible. Using user session recordings, you can expand on the user behavior analysis to include analyzing crashes, using these recordings to resolve crashes, bugs, and ANRs. See the exact reasons behind your completion rates for each stage of your funnel. Watch session recordings of drop-offs to understand why users have abandoned a process and what can be improved. With touch heatmaps and session recordings, you’re able to see exactly how your programmatic ads appear to your users and how they interact with them. With this capability you can identify which ads are harming your UX and quickly optimize your ad serving. To further attest to the power of these use cases, we conducted extensive research from September 2017-September 2018, where we identified some interesting trends regarding increased adoption of qualitative analytics. There are 5,872 apps that have over 5 million downloads in the Google Play store. And in the top 100 rankings per category, we’ve identified that 64% of those app are already using qualitative app analytics. And in the iOS App Store, there are 4,390 apps that have over 5 million downloads. 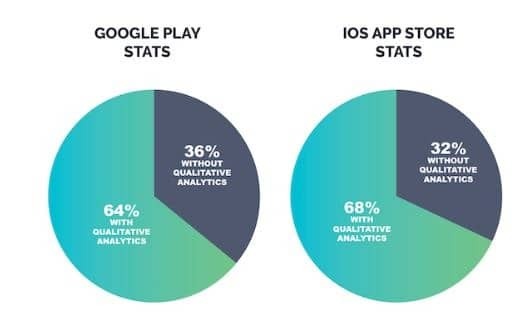 In the same top 100 rankings per category, 68% of those apps are already utilizing qualitative app analytics. Focusing specifically on enterprise apps, we saw that 65.7% are using the qualitative technology to track users and their behavior. There’s no question that this SDK has entered and secured its spot in the “late majority” of the mobile analytics industry. *The term “top apps’ denotes apps across the Google Play and App Store that have garnered 5M downloads or more and fall within the top 100 rankings per app vertical. How does Qualitative Analytics correlate with Ranking, Rating, and Installs? We’ve established that the majority of enterprise apps have adopted qualitative analytics, but how do these apps compare to their counterparts who haven’t integrated this SDK? 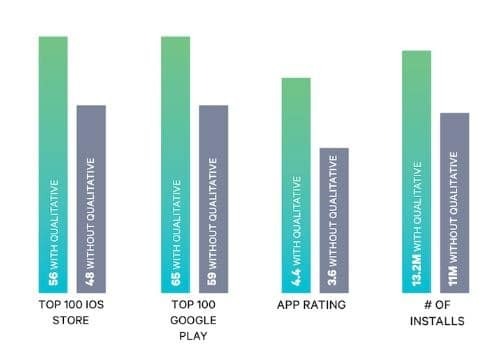 Looking at ranking, rating, and installs, we conducted (more) research on the correlation between apps with the integration of qualitative analytics, and apps without. The critical question that propels qualitative analytics is a simple “why?” Quantitative/traditional app analytics gives you the numbers, the data that you need to analyze, but you have no idea why that crash happened, or why users dropped off at the Payment screen, why the Sign In button was unresponsive on the login screen, and the why list goes on and on. This is where qualitative analytics takes center stage.